fabulous motherhood: A visit to Brainybunch Islamic Montessori (BBIM) Open Day ..
A visit to Brainybunch Islamic Montessori (BBIM) Open Day .. 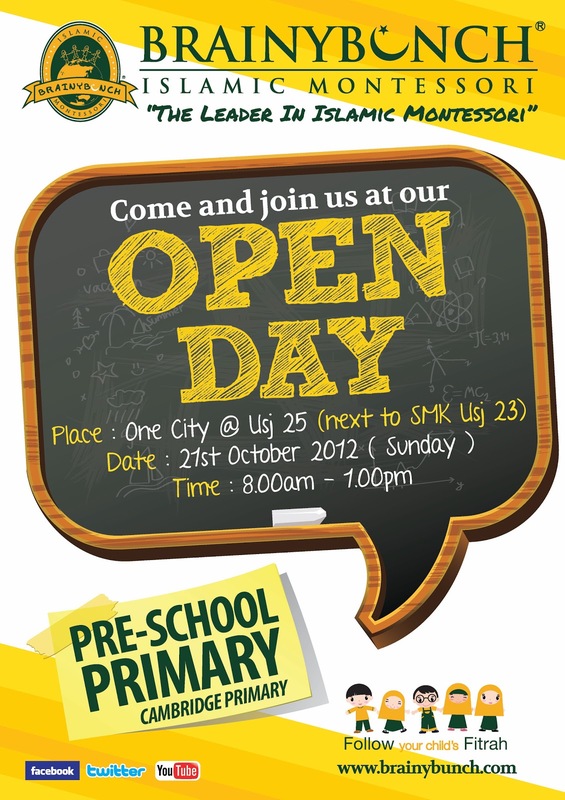 Since we have made pre-booking for Adam pre-school couples of weeks ago at this school *ehem ehem the green school as being told earlier*, we have been invited for their Open Day at Campus Putra Height/ USJ. Seriously, mommy Adam paling excited habis. I was so eager to visit this new campus. Previous visit pun, tempat tu belum fully set up, so banyak yang tak siap, tak best lah kan. So we went there on Sunday morning, *haha since entry lama duk pending as draft, actually 2 minggu lepas dah*. After pre-registration at the counter, dapat goodie bag jugak, *I loike* , we straight away made our moved to their pre-school class at first level. We reached there around 10am, *not mistaken*, and we were really sure that was not Adam's nap time. But he was so excited smp susah nak control. Lari sini sana, not behaved well langsung. Pening mommy and papa tengok. I assumed because, before this, we kept on telling him that he will get chance to visit his green school. We also told him that green is very exciting place and fun. Agaknye, tu dia enjoy to the fullest. Nasiblah aunties kat situ, tengok dapat true color anak I yg super active. Hahahha!! Since, I dapat 2,3 kali visit and study their method of islamic montessori, and apparatus yg dia pakai. So I tak spent time lama sgt lah at each station. Setiap subjek diasingkan mengikut color. And each color will represent max of 15 kids at one group. All the kids will be supervised with one aunty and that aunty which also their teacher will teach them from one section to another section follow their daily schedule. So senang kata, aunty tu nanti boleh tengok perkembangan anak kita. There will be no homework or exam, and each kid will assessed daily by using the assessment list. The group of 15 kids were combined from 4-6 years old kids. Each section such maths, language, wisdom, Iqra etc etc, there will be apparatus to be used by the kids. To ensure the kids not simply play with all the apparatus, the first few weeks, student will be teach with the ground rules to behave at their school. Each group of kids will have their own time for brekkie, lunch tine and tea..
A very spacious mussola where the islamic subject will be teach here..
At the same area with preschool, there is one corner for playhouse, for kids between 18months - 3 years. The place is so cute..
Budak bambam pun tompang enjoy sekali.. Cute plak, kecik2 dah belajar kan..
All the kids enjoyed playing toy so much..
Each class dia ada mini garden at back and front yard..
Our first visit is at Maths Class..
All with red theme, from carpet, curtain and wording..
Adam enjoyed using the friction apparatus.. They will learn musics here..ada guitar, violin and drum set..
Not mistaken, this is at language class..
Ada dining hall for elementary students, gym centre, and musolla..
Semangat Adam nak main ping pong.. Seriously, elementary school diorang mmg impressive habis. They still using Islamic Montessori concept and syllabus plak pkai Cambridge punya. By the way, elementary class dia sekarang diorang baru launch utuk students 7-9 years old. Wow bestnyer! Mase zaman2 kita drawing2 pun dah kira best! adam dah tak sabar tu nak g skool, nadia..
cutenye ryan with his smile. chubby!